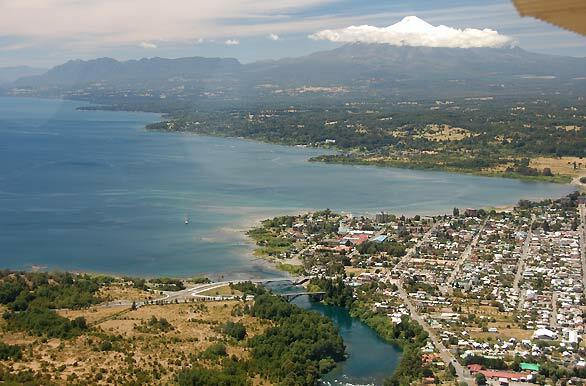 Villarrica , is located in the Ninth Region of Araucania , 86 km km from Temuco and 764 km km from Santiago . It covers an area corresponding to the upper watershed of the river Toltén , including the Grand River Valley Glacier Trancura , lakes Villarrica , Caburgua Huillipilun , C olico , Quillelhue and Tinquilco , plus a host of lakes , rivers and estuaries . is an area blessed by nature , which has moreover the Villarrica volcano ( 2847 m ) , Quetrupillan ( 2,382 m m ) and Lanin ( 3747 m ) located on the border with Argentina . But this is only part of the natural resources, besides the cultural and added to the traditional hospitality of its people have transformed Villarrica in major tourist destinations in Chile . km from Santiago . It covers an area corresponding to the upper watershed of the river Toltén , including the Grand River Valley Glacier Trancura , lakes Villarrica , Caburgua Huillipilun , C olico , Quillelhue and Tinquilco , plus a host of lakes , rivers and estuaries .